Padang Padang is a little white sandy beach on the Bukit peninsula located at the southern end of the island of Bali, Indonesia, not far from the famous Uluwatu temple. The small cave entrance and the small beach within gives an atmosphere of a hidden oasis. 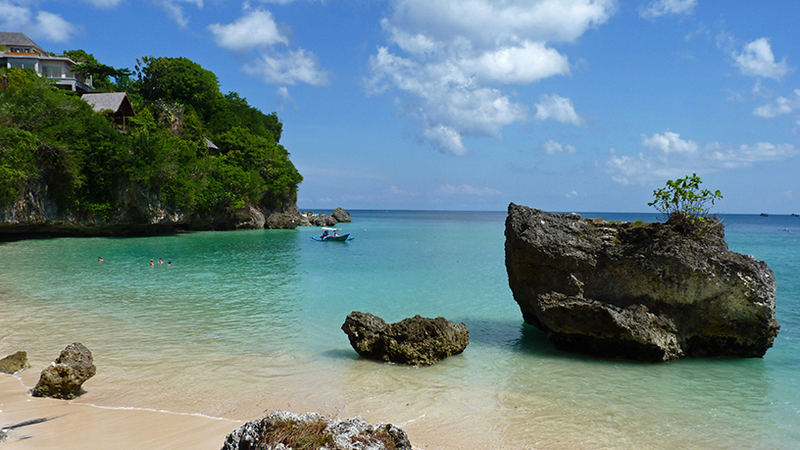 Enjoy the crystal clear water, silky soft white sand and breath-taking cliffs and rock formations. If you're looking for luxury and sophisticated cocktails then go your way! This beach is just a beach, with a local warung offering Bintang, water and some local soda drinks. Padang Padang is one of the famous surf points in the Island of Gods. The so-called « Balinese Pipeline » is a classic, extremely hollow, very shallow left-hand reef break for experts. It's one of the most beautiful surfing barrels in the world but needs a major swell to work. Many traveling surfers spend their entire time in Bali without ever witnessing Padang's true potential.